Fr. Ray challenged me. I protested that I was exempt, as there was no way a woman could be a priest, let alone a Cardinal Archbishop. Ha! My triumph was short-lived: Fr. Ray told me to imagine that I was the power behind the throne, a trusted advisor. My comment that this was the problem in the first place (too many wimmins' libbers putting the boot in) fell on deaf ears. - the immediate consecration of the diocese to the Immaculate Heart of Mary take place. - all hymn books should be burned. An authorised Catholic Hymnal would be issued, containing all the original un-pc versions of hymns written before 1950. Any hymns written after 1950 would have to obtain the Nihil obstat and Imprimatur before being added to the Hymnal. - all Holy Days of Obligation should be restored to their original days. These days would be reinstated as major religious holidays. - liturgical dance and "acting out of the Gospel" at Mass should be banned. - euphemistic monsters would be prohibited at Mass. Extraordinary Ministers of Holy Communion would only be permitted in order to take Communion to the Sick and Housebound. - Catholic schools would have to demonstrate that they had more than 90% pupils and staff going to Sunday Mass. Schools which failed to fulfil this requirement would be closed. The money saved could be used for the schools which remained, and for parish catechesis. The smaller number of Catholic schools which remained would be exempted from the National Curriculum. Holy Days of Obligation would be days off school. The Easter Holiday would be Holy Week and the Octave of Easter. What?? You wanted to see the hair colour! I don't need to show the rest of me! 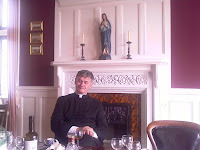 I am very lucky: Confessions are available in my parish at a time which suits me very well, and my PP is good when it comes to hearing Confessions and dealing with the issues which arise. I haven't always been so lucky. I have had comments which have discouraged me ("Do you always go to Confession this often?") and comments which have been completely off the wall ("It's not good to be alone. You should get married!") It is also disconcerting to be told to confess only one sin, and to ignore the others. 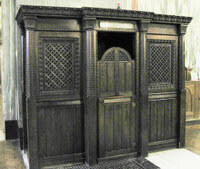 Despite plenty of practice, easy availability and a good Confessor, I still find it very difficult to go to Confession: I don't really like to admit that I've been in the wrong. So it's helpful to look at the Sacrament in detail every now and then, in order to ensure that things aren't being skipped over too lightly. Fr Zuhlsdorf has, very helpfully, put up a re-post of his 20 rules for penitents. And Fr. Ray Blake has taken the opportunity to post a few recommendations for priests hearing Confession. Definitely well worth a read. Half term holidays have begun. Not a moment too soon - I was perilously close to oversleeping this morning! I haven't really planned very much for this holiday, knowing that I need all the sleep I can get. ...Something I really missed last year: the sheer enthusiasm of Year 7 kids! These are the 11-12 year-olds who started at "Big School" back in September. 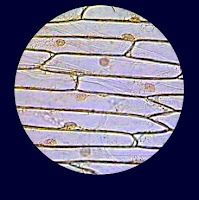 Today I taught them how to make a microscope slide with onion epidermis. Each group had to set up their own microscope, extract the layer of onion epidermis, put it on the slide, add iodine, put on a cover slip (avoiding air bubbles) and then have a look at their slide down the microscope. "Proper" science stuff. The kids loved it, and were terribly excited when they actually saw the results - and then went round looking at everyone else's slides. Suddenly all the stuff in the textbook became real for them. ...Very lucky indeed, that I have found a hairdresser who understands what I mean when I describe the hair colour I want to achieve. After falling asleep during a staff meeting this afternoon, (well, it was very tedious!) I went on to fall asleep (briefly) in the salon while waiting for my hair colour to develop. It might, however, be a good idea for me to go and have a very early night. Half-term cannot come quickly enough! It would appear that a few fellow bloggers have weighed in on the Westminster Sweepstakes with the consideration of Fr. Ray Blake for the top job! UPDATE: Through some careless mistake, Fr. Ray forgot to appoint Karen H. as his Campaign and Publicity Co-ordinator. Luckily Karen accepted the job anyway. Check out her excellent campaign material HERE. Anyway, I could have phoned out for a take-away, but I felt I needed a change of scene. Added to which, I fancied a glass of wine with dinner, and didn't have anything suitable in the flat. I hate to open a bottle of wine when I know that I'm just going to have a single glass and then nothing for several days... So I ventured out into my local neighbourhood, as there are a few eateries along my local High Street. The nearest one to me was closed for refurbishment, so I was forced to go a little further afield. The restaurant in which I finally fetched up was one I hadn't visited before, and it was a bit of a shock. There was a doorman, dressed completely in white (including a turban) looking remarkably like one of the Indian servants from "It Ain't Half Hot Mum." I was fascinated: he spent the entire duration of my stay by the door, almost like a nightclub bouncer. Come to think of it, given the fact that there are some very roudy teenagers who go round in gangs near where I live, that could be his actual role...! There were a few other diners in evidence, but the place was mostly empty: not surprising for the middle of the working week. I had brought a book, and settled down to enjoy my lamb pasanda with a glass of very good house white. To my surprise, even though it was mid-week, there was live entertainment. Apparently it is different each night. Tonight we had a belly dancer. Not a real one - the young lady concerned had the sort of figure favoured by Western culture, and there wasn't much "belly" although her abdominal region was very much on display. A friend of mine from a few years back trained as a belly dancer, and watching her abdominal muscles gyrate was quite an eye-opener... this evening's dancer didn't attempt anything of the sort, but there was much waving of arms, legs and chest. I have been busy today. While teaching about polymers (*big yawn*), I've been getting my Year 10 classes to make "silly putty" out of PVA glue and borax solution. ...and now I'm pretty much pooped! No more blogging for today... I'll be back tomorrow.